We are almost done with our homeschool year and I have to say this year has gone by so much more smoothly than other years. We have had some hiccups and things haven’t always gone according to plan, but it has been pretty enjoyable. Part of the reason for the ease this year was the switch to Sonlight for my son. I wrote about how much we have enjoyed using Sonlight this year if you would like to take a look. One of those reasons is because of the Guides they include in the curriculum- the Student Guide and the Instructor Guide. Lessons plans are already done for both of us for the entire school year. It has been wonderful! I don’t think I could ever go back to creating my own lessons plans after this year. Sonlight has graciously gifted me one complete level of curriculum in exchange for my honest review. When I was in the research phase, I had a hard time finding a lot of good information on the Instructor Guides. Sonlight does tell you that lesson plans are laid out for you and they do give a lot of information on their website. But I was looking for reviews or testimonials from other homeschool moms and I did not see a lot. 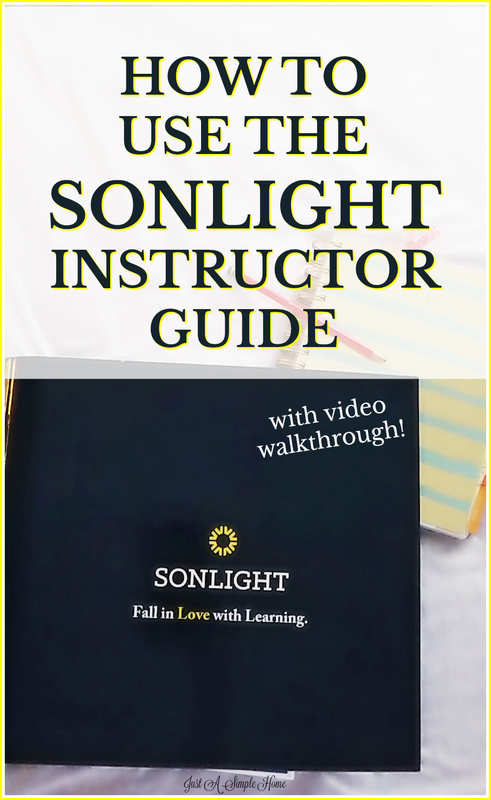 So, I thought I would take you inside my Instructor Guide and give you an inside look, so you can decide for yourself if you would benefit from using the Sonlight Instructor Guide yourself. Do you think having a Guide like this would make your homeschool life easier? Don’t forget to subscribe to my channel for more homeschool videos!